Handheld flashlights make two-handed activities awkward and sometimes impossible when external lighting is poor. You can either place the flashlight in your mouth or set it down on a convenient surface. Unfortunately, nearby surfaces at the right height are rarely available. Headlamps will free up your hands but they have two disadvantages. First, they’re bulky. If you’re working on electronics inside a console, you must exercise care not to bump the headlamp against any “hot” components. This is less of a problem with your glasses and their tiny LED lights. Second, you can’t realistically wear headlamps all the time. The headband gets uncomfortable and wearing headlamps isn’t socially appropriate in many situations. Therefore, it’s something you must remember to always carry with you, which isn’t feasible. 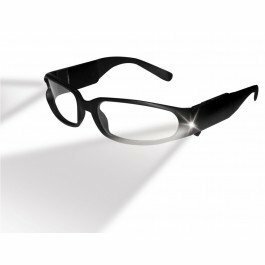 On the other hand, since you must always wear prescription glasses for correcting your vision, the LED lights on lighted prescription safety glasses are always with you for use in both expected and unexpected situations. If you get a flat tire or have engine trouble on the drive home for example, you can readily take care of the problem because it doesn’t matter that you forgot to bring your flashlight or headlamp with you. Truck driving. The truck driver works long hours that often include night driving. There’s no need to ruin your night vision or your partner’s by turning on the cab light. This convenience also exists for the ordinary motorist as well. Auto repair. When working under your car, lighted prescription safety glasses not only protect your eyes from flaking rust and dripping fluids, they provide light exactly where you need it: where you’re looking. There’s no need to drag a lamp around next to you, which will cast shadows. Even if you don’t work on your car or do professional auto repair work, the lighted safety glasses come in handy at self-service stations at night. You can readily read your tire pressure gauge when adding air to your tires. You won’t have to read your car’s oil dipstick or add an extra quart of oil to your engine in the dark. Plumbing and electrical work. Both plumbing and electrical work often require use of both hands in poorly lit areas. While a manufacturing floor is well-lit in areas where the regular employees do their work, the maintenance person doesn’t always have this convenience. Your work area is wherever the breakdown happens to be, and that’s often in poorly lit places. Other situations include electrical work in attics with poor lighting or plumbing while laying on your back in a tight crawlspace. Reading. When you can’t sleep at night but don’t want to disturb the person with you, use your lighted glasses to do some quiet reading. This is useful in dormitory and camping situations as well. Power outage. When bad weather knocks the power out, the odds are good that you won’t be next to a flashlight or a candle. There’s no need to stumble around in the dark looking for the items because you have lights on your glasses. Lighted prescription safety glasses also come in handy when going down the stairs in the dark to get to the circuit breaker boxes.